So, it turns out the people of India (1.28 billion and counting) have British Fabianism to thank for the mysterious missing affluence that should characterise their country by now. For 46 years from its independence until 1991 India's government owned and controlled the majority of industries, attempting a middle way between the state command economy of the contemporary Soviet Union and the surviving semi-free market of the US . One key characteristic of this control was tight regulation through occupational and business licensing in a hopelessly corrupt mess called the License Raj. Apparently the growth situation over those four-and-change decades was so uniquely slow it became known as the Hindu rate of growth. B Shantanu discusses it at some length, explaining the snail's pace rate of economic growth, much like that of the entire so-called Third World at the time, as it went through rapid population growth but achingly slow per-capita GDP increase. 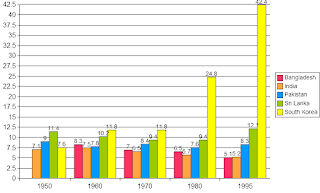 The figures are in fact average economic growth during the 50's to 80's of 3.5%, but due to that rapid population growth per capita incomes grew at only 1.3% per annum. This trend will probably come up again in future articles about nations - Tanzania, Zimbabwe, Haiti, Venezuela, Cuba, Laos, North Korea - that remain poor as of the early 21st Century. Courtesy of Wikipedia - size of 5 econs per capita as %-ages of United States GDP per capita. Rajnikant Puranik at Swarajya Blogs investigates the term itself, pointing out its in-built cultural racism. Calling a growth rate by a cultural identifier is, admittedly, bizarre, and smacks of the unintentional racism of the German Historical school or Institutional school of economics. He posits any number of better names referencing the fiend Nehru, his progeny and the principal that underlay this ridiculous experiment; socialism. That's a pretty damning comparison between the quasi-socialist Indian experiment and the capitalist Korean experience, one which has led to the ROK becoming an OECD member and graduating into the club of countries characterised by pretty much universal affluence, while India remains, even after several decades of rapid economic growth, in 131st place in terms of nominal per capita GDP. 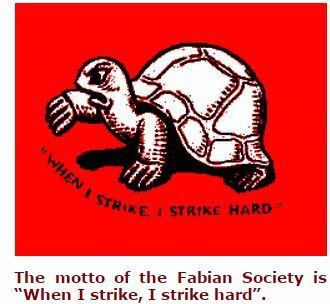 Socialism as state ownership of the commanding heights of the economy and comprehensive state welfare services had - and still has - the Fabian Society of London as its intellectual hearth. These guys advocate for democratic state socialism precisely as put into practice by such Fabians as Nehru and his offspring in India. As Puranik makes clear, much of the regulation and a minority of the state controlling interests in businesses remain even to this day, products of pork-barrel politics, and if only the country could cast aside the last vestiges of its awful socialist past it could easily achieve double-digit economic growth that would lift its entire population out of poverty in only 20-or-so years.